If dark pop-rock is what you favor, RIVALS is the band for you! 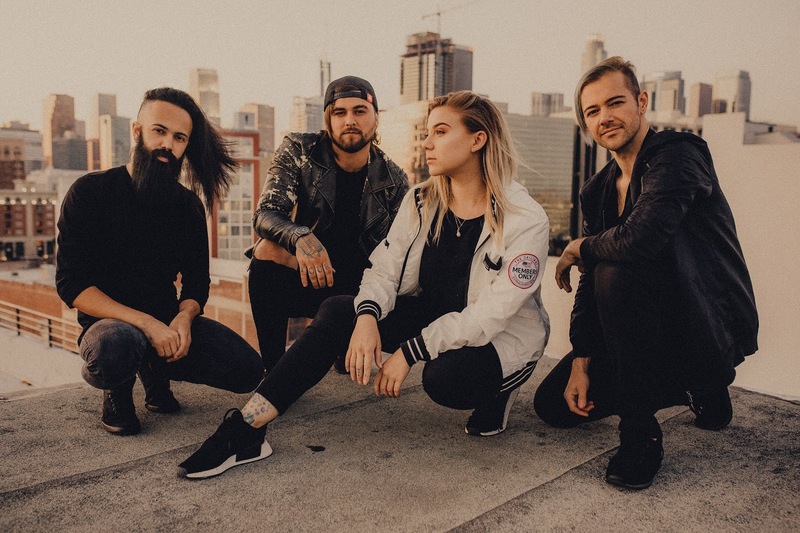 Formed in Los Angeles, CA in 2014 by vocalist Kalie Wolfe, bassist Sebastian Chamberlain, guitarist Micket Woodle, and drummer Josh Alves this team of rockers are combining their talents to produce a sound that’ll have you up on your feet and wanting more. With Wolfe's powerhouse vocals and the band's raw attractive sound, RIVALS powerful and relatable lyrics bring forth a fearless and captivating feeling that makes their music stands out above the rest. Since the release of their debut EP in 2015, titled Haunted/Hunted, the band has been making moves and seem to be climbing higher and higher that ladder of success. Check out our interview with RIVALS and see how they came to be, what it is that drives them and everything else in between! C&C: Let’s start from the beginning. Why don’t you tell us a little bit about how RIVALS began and got together? Kalie: "Back when I was 17, I was a photographer and I actually did a tour with Micket for one of his old bands. He heard me singing one day in the van, about 2 years later, he hit me up about doing a song with him, and we started jamming a little. Eventually we announced RIVALS back in 2014!" C&C: What made you want to get into the music industry? Micket: "I was in my living room playing air guitar with my brother to a music video by Korn on MTV and I remember thinking how cool it would be to actually play guitar for a band and that’s when I decided I wanted to be a musician." Sebastian: "With my mom being in the music scene a lot. As a kid I was alway constantly surrounded by musicians and always seeing them on stage started to inspire me. And a lot of it also had to do with my step dad Diego Russo I was always blown away about how dedicated, and amazingly talented he is." Josh: "Growing up I always wanted to draw comic books which was always heavily influenced by rock and metal but my grandparents always had musical instruments around the house. My great grandfather was a respected Mandolin player and loved playing during house parties and family events so I was always around musicians. It wasn’t until I listened to the band Slipknot while in 7th grade did I have any thought of being in a band or learning an instrument seriously." C&C: Who or what influences and inspires your sound as well as lyrics? Kalie: "Sound wise, we all REALLY love 30 Seconds to Mars and Bring Me The Horizon, but me personally, I LOVE pop. Jessie J, Demi Lovato, Billie Eilish, Tove Lo, I could keep going lol. Lyrically I just kind of write what comes to my mind. Usually dark and sad but sometimes happy and hopeful." Micket: "I’m really inspired by movies, I try to see our music as if it was in a trailer for a movie and how the scene would play out. Some kind of big box office hit and how the music helps carry you through this trailer and make you wanna see the movie more then anything." Josh: "My sound as drummer comes from listening and watching bands like Deftones (Abe Cunningham), Periphery (Matt Halpern), Joey Jordison and Chad Smith." C&C: What has been your greatest struggle as a band so far? Micket: "I think our greatest struggle as a band so far is figuring out who we are. Not just as musicians musically but as a band as well. I feel like all bands have to figure out what they wanna do at first and then learn to evolve with one another to become something great musically and that goes for us as people as well. You have to learn how you fit together as people and help make each other better people and evolve into not just close friends but a family that’ll stick it out with each other through and through." Josh: "I feel that any bands greatest struggle will be how they adapt to living on tour with one another. Not just for a week or two but for weeks and months on end. That’s where you grow your biggest bonds." C&C: On a brighter note, what has been your greatest achievement? Kalie: "We were featured on Billboard for our release of Damned Soul, Alt Press (in and on) for Over It. We are currently touring with The Red Jumpsuit Apparatus. We were played on KROQ 106.7 radio station in Los Angeles, and so many others!" C&C: Your debut full-length LP, Damned Soul was recently released. What was it like creating that album and what can fans expect from it? Kalie: "To be honest, long and at times difficult. It was everyone in the bands first full length and its A LOT of work. It was for me personally sometimes really hard to express how I was feeling in a way that was poetic and angelic. I just really wanted to make sure it was something I was going to be proud to put out. You can expect power, darkness but always a glimmer of hope." C&C: Which song from the album is your personal favorite and why? Kalie: "I feel like I’m still going to stick with Reflection, its just so fun to play live and the meaning behind the song is deep for me. This song has a lot to do with when I was younger, lost, and usually so intoxicated I couldn’t function. I wrote it about all these people who were surrounding me, that were pulling me deeper into this storm of misery. I kind of had a realization moment where I needed to pull myself out before it just got worse. So the chorus is about me doing that, pulling myself out. Saving the tiniest piece of myself for me. For once being selfish in a way, understanding that I can’t keep living a life like that if I wanted to be who I saw myself as. The only thing I knew, was I was going to be alone and its something I had to accept to fight through as I changed myself. My personal Reflection." Micket: "My personal favorite song is Keep Going. It’s fast and heavy and it has a killer drum solo. Sebastian: “ My two favorite would have to be Damned Soul and Keep Going. Damned Soul really hits home when it comes to not feeling yourself. But knowing it will get better and things will get brighter. Also, it is extremely fun and energetic live. Keep Going is a little different compared to the rest of the songs on the album and in a way makes it stand out. And, the fact it has a drum SOLO! I feel it brings differences to the song and lyrically is an inspiration to always keep trying no mater what." Josh: "My two favorite have to be Moonlit and To Lelia. Both are very emotionally driven which makes you feel something deep within you instantly. I feel like this is also represented live in the best way possible with our performance." C&C: Who has been your favorite band to perform with so far and who would you like to play with in the future? 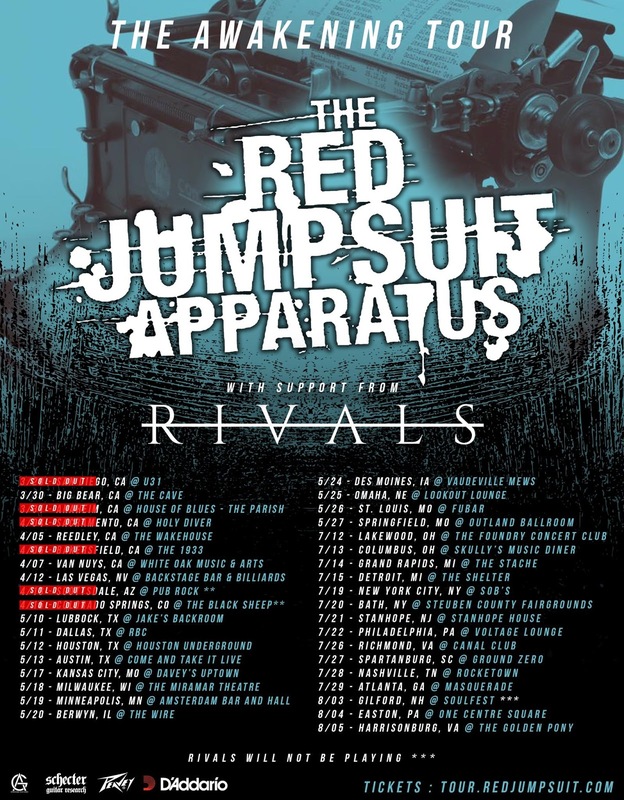 Kalie: "Honestly, RJA has been a highlight of mine, I LOVED them growing up and I’ve gotten to play a lot of sold out shows with them. Its very surreal. To play with : Underoath, Bring Me The Horizon, Too Close to Touch, Emarosa to name a few." Josh: "The guys in Red Jumpsuit and Scars Heal In Time are some of our favorite people to hang with and watch every night. In the future I would love to tour with Undernoath, New Years Day and Bring Me The Horizon." C&C: What can fans expect in the near future? Kalie: "Lots of touring, hopefully some new music videos and more music also!" Josh: "Touring, music videos, new music and rad times!" C&C: Any last words for your fans and Cupcakes & Crossbones viewers? Kalie: "Keep going, never stop, never quit! YOU GOT THIS!" Sebastian: “Thank you all so much for the love and support. It means the world to every single one of us. If it weren’t for all of you we would be nothing and for that we are forever grateful. And just remember if you’re feeling alone, down, or left out, you are worth more than you think, but it’s up to you to see it for yourself. Prove yourself wrong. Show that you are strong, you’ve made it this far. Keep going." Josh: "Never give up on your dreams and goals. You can attain so much and live such a fruitful life if you can believe in your self and never look back. Thank you for believing in us as we believe in you."